VITEC has become a shareholder of Anevia, a global provider of OTT and IPTV software for the delivery of live TV and video on demand (VOD). VITEC now owns eight percent of Anevia’s share capital through an over-the-counter transaction of a block of shares. Founded in 2003 by the developers of the VLC media player, Anevia pioneered cloud DVR and multiscreen solutions, enabling viewers to watch TV wherever, whenever, on every screen. Anevia software and solutions have been successfully adopted by TV broadcasters, tier oneand tier two telecommunication service providers, and many private and public companies. Most recently, Anevia has undergone a major transformation within its product offering, as well as cost restructuring within some areas of the organization. These actions have resulted in a return to growth and allowed Anevia to improve its profitability. Combining broadcasting with live streaming capabilities, VITEC features the most extensive H.265 (HEVC) and H.264 offering on the market. The company deploys its broadcast-grade streaming appliances and IPTV and digital solutions across a broad range of sectors that include broadcast news agencies, military units and government departments, multisite houses of worship, business corporations, and multipurpose arenas and stadiums. Its clients include the Golden 1 Center multipurpose arena in Sacramento, CA; the Amway Center in Orlando, FL; Feature Story News (FSN) broadcast news agency; U.S. Air Force Academy’s Center for Character and Leadership Development; The Bridge Christian Church, and others. 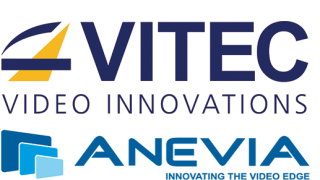 "I am very delighted to see VITEC joining Anevia’s shareholders,” said Laurent Lafarge, CEO of Anevia. “This is a strong sign of the international recognition of Anevia technology. I am convinced that this first step will initiate a collaboration that should contribute to the future growth of Anevia—particularly in the enterprise market segment, building on VITEC’s experience in many industrial sectors, notably sport, education, medicine, and transport."